On May 6, Rev. David Andrus received a double honor. Concordia University, St. Paul, Minnesota, asked Andrus to deliver the commencement address for the graduation ceremony. This was special, as Andrus graduated from there 35 years prior. Here are a few highlights from the commencement speech he delivered. We are hoping to receive and post an audio version soon. Thirty-five years ago, I was where you are. You are excited, looking forward. When I was where you are, I looked back and marveled that I had gotten that far. I lost my sight at age 11. My parents were supportive and encouraging. While at Concordia, a professor encouraged me to be a pastor. He believed in me so much that he learned Braille so that he might teach me Greek himself. And so I learned Greek. And so I became a pastor. Like you, I learned many things here at Concordia. In Math, I learned how to think logically. In Science, I learned to think a problem situation through to a solution. In English, I learned that humanity is resourceful. In Art and Music, I learned there is enjoyment in the midst of hardships. I also learned, it's not about me. It's about service to others. Even more than that, you and I have learned here at Concordia about faith. Trusting in God has great value. We are God's workmanship, as this year's theme states. And because we are his workmanship we have value to him. Yes, even when the world and people call you broken or limited, you are God's workmanship, created for good works. He values you. So thank you, Concordia, for 35 years ago. Thank you for today. Set your dreams, hold to goals, work hard, be thankful. When the commencement speech was over, the second honor came. Andrus stepped back from the podium and a doctor of letters was bestowed on him. This honorary doctorate was given for his many years of work and service for people who are blind in the kingdom of God. 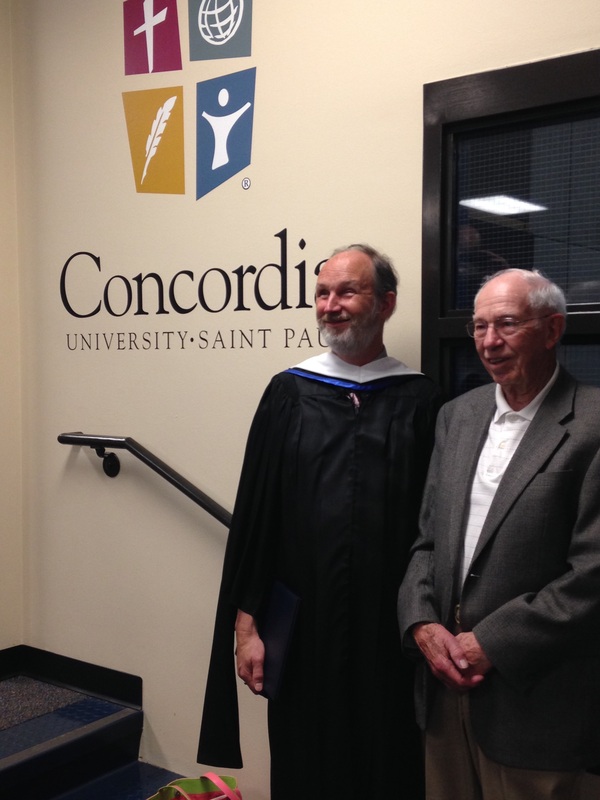 In the picture we have Pastor Dr. Dave Andrus and his Father in front of the Concordia logo painted on the wall near the stairs.